Innovision (6.07.2018) - Formosan macaque - ROCUPEX 2018 Changhua. Mint label - SPECIMEN. Innovision (6.07.2018) - Formosan macaque - ROCUPEX 2018 Changhua. Special presentation pack with one strip of two mint labels - SPECIMEN. Innovision (6.07.2018) - Formosan macaque - ROCUPEX 2018 Changhua. Unique piece! Special presentation pack numbered 001 with one strip of two mint labels - SPECIMEN, numbered 00001 & 00002. Innovision (6.07.2018) - Formosan macaque - ROCUPEX 2018 Changhua. Special presentation pack with one strip of THREE mint labels - SPECIMEN. Innovision (6.07.2018) - Formosan macaque - ROCUPEX 2018 Changhua. Machine 107. MAGENTA + GREEN imprint. Presentation folio with two mint sets of 12 values, domestic mail (NT$8-15-28-35) and international mail(NT$9-13-15-17), plus SPECIMEN label and postcard. Innovision (6.07.2018) - Formosan macaque - ROCUPEX 2018 Changhua. Machine 124. MAGENTA + GREEN imprint. Presentation folio with two mint sets of 12 values, domestic mail (NT$8-15-28-35) and international mail(NT$9-13-15-17), plus SPECIMEN label and postcard. Innovision (6.07.2018) - Formosan macaque - ROCUPEX 2018 Changhua. Machine 125. MAGENTA + GREEN imprint. Presentation folio with two mint sets of 12 values, domestic mail (NT$8-15-28-35) and international mail(NT$9-13-15-17), plus SPECIMEN label and postcard. Innovision (6.07.2018) - Formosan macaque - ROCUPEX 2018 Changhua. Machine 126. MAGENTA + GREEN imprint. Presentation folio with two mint sets of 12 values, domestic mail (NT$8-15-28-35) and international mail(NT$9-13-15-17), plus SPECIMEN label and postcard. Innovision (6.07.2018) - Formosan macaque - ROCUPEX 2018 Changhua. Machines 107 + 124 + 125 + 126. MAGENTA + GREEN + BLACK imprint. Full set of 12 mint ATMs, domestic mail (12 x NT$8). All the machine / colour combinations available at ROCUPEX 2018. Innovision (6.07.2018) - Formosan macaque - ROCUPEX 2018 Changhua. Machines 107 + 124 + 125. MAGENTA + GREEN + BLACK imprint. Pictorial first day cover with three ATMs, domestic mail (3 x NT$8). Innovision (6.07.2018) - Formosan macaque - ROCUPEX 2018 Changhua. Machines 124 + 125 + 124. MAGENTA + GREEN + BLACK imprint. ROCUPEX 2018 prefranked pictorial first day cover mailed to Spain (NT$28 + 3 x NT$1). Pictorial postmarks. Innovision (6-9.07.2018) - Formosan macaque - ROCUPEX 2018 Changhua. Machines 107 + 124 + 125 + 126. MAGENTA + GREEN + BLACK imprint. Full set of four daily pictorial covers with the exhibition motifs, each cover with the ATMs showing the machine / colour combinations available (4 x NT$5), and the daily postmark. Innovision (6.07.2018) - Formosan macaque - ROCUPEX 2018 Changhua. Machine 94. BLACK imprint. Mint ATM (NT$1). Innovision (6.07.2018) - Formosan macaque - ROCUPEX 2018 Changhua. Machine 94. BLACK imprint. Mint ATM (NT$5). Innovision (6.07.2018) - Formosan macaque - ROCUPEX 2018 Changhua. Machine 94. BLACK imprint. Mint ATM, domestic mail (NT$8). Innovision (6.07.2018) - Formosan macaque - ROCUPEX 2018 Changhua. Machine 95. BLACK imprint. Mint ATM (NT$1). Innovision (6.07.2018) - Formosan macaque - ROCUPEX 2018 Changhua. Machine 95. BLACK imprint. Mint ATM (NT$5). Innovision (6.07.2018) - Formosan macaque - ROCUPEX 2018 Changhua. Machine 95. BLACK imprint. Mint ATM, domestic mail (NT$8). Innovision (6.07.2018) - Formosan macaque - ROCUPEX 2018 Changhua. Machine 076. BLACK imprint. Mint ATM (NT$1). Innovision (6.07.2018) - Formosan macaque - ROCUPEX 2018 Changhua. Machine 076. BLACK imprint. Mint ATM (NT$5). Innovision (6.07.2018) - Formosan macaque - ROCUPEX 2018 Changhua. Machine 076. BLACK imprint. Mint ATM, domestic mail (NT$8). Innovision (6.07.2018) - Formosan macaque - ROCUPEX 2018 Changhua. Machine 081. BLACK imprint. Mint ATM (NT$1). Innovision (6.07.2018) - Formosan macaque - ROCUPEX 2018 Changhua. Machine 081. BLACK imprint. Mint ATM (NT$5). Innovision (6.07.2018) - Formosan macaque - ROCUPEX 2018 Changhua. Machine 081. BLACK imprint. 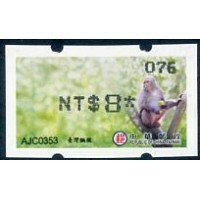 Mint ATM, domestic mail (NT$8).